On September 2nd, Sega AM2 held the AM2 Summer Festival, an event held across Japan as thanks to fans, at its final location of Tokyo. A great number of fans raced to the venue and enjoyed an action-packed show that included live music, skits and gaming competitions. A long line at the entrance, continuing around the back. 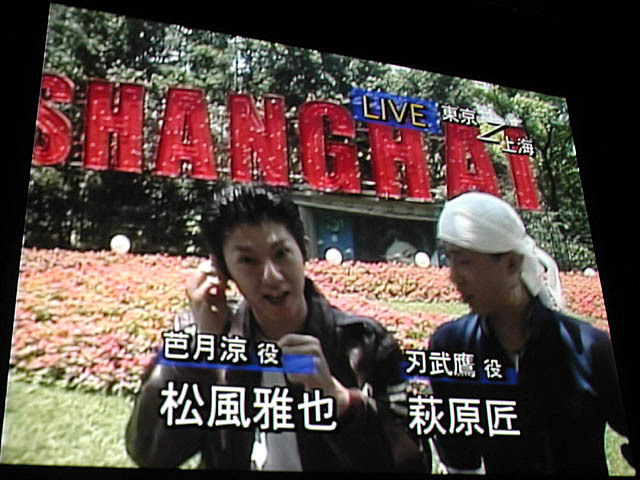 The show got started, and shown straight away was the Making of a Shenmue II Commercial in Shanghai, produced by Masaya Matsukaze, who plays the role of Ryo Hazuki in Shenmue II together with Takumi Hagiwara (Wuying Ren). 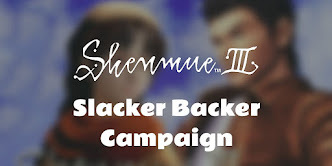 In the video, the two have traveled to Shanghai in order to film a TV commercial for Shenmue II. They roam around Shanghai scouting for a location, but can't find anywhere good. featuring Masaya Matsukaze and Takumi Hagiwara. Then, just at the point where the finished commercial was to be played, the pair came out onto the stage. The commercial that they filmed ends up being... only audio. However, they did also reveal their participation in commercials currently being aired on TV. After the video, Matsukaze and Hagiwara appeared on stage. Hazuki Ishigaki, lovely as always. 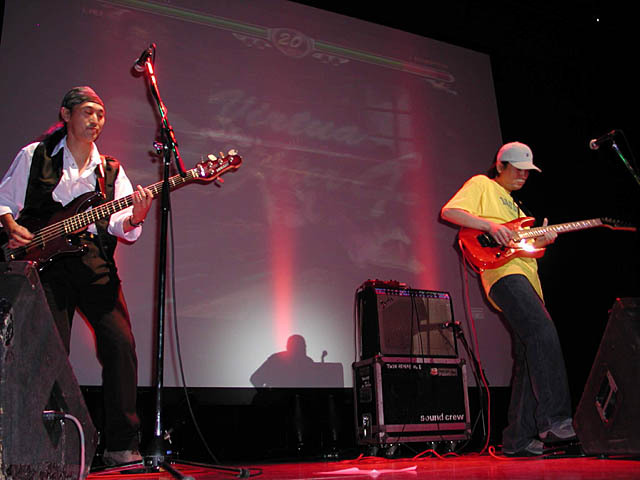 After introducing the various features of Shenmue II, next the "AM2 Sound Unit", a group formed specially for this tour, started a live performance of music from Virtua Fighter 4. They played 4 songs in total, including the theme and music from each of the stages, while images from Virtua Fighter 4 were displayed behind them. The audience hugely enjoyed their splashy and spirited performance. The specially-formed "AM2 SOUND UNIT" rocking out some live Virtua Fighter 4 music. 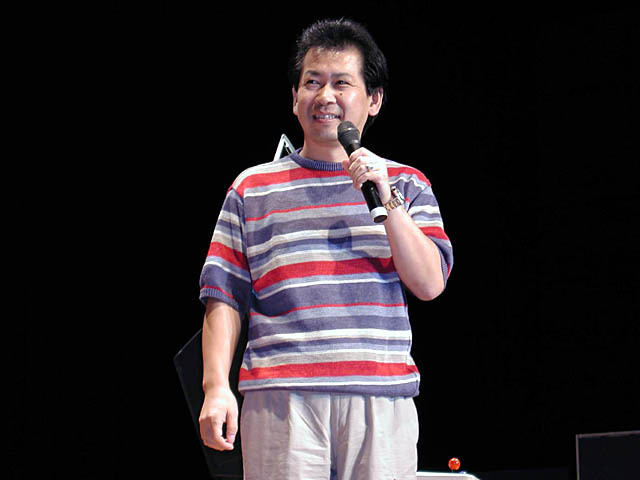 And then the star of the show appeared: Yu Suzuki, producer of such hits as Virtua Fighter and Shenmue, stepped onto the stage. Suzuki commented about the event: "I get worn out being shut away in a development room all the time, so I feel that mingling with fans like this gives me energy". Looking back on the other locations where the event was held, he said "It's interesting because each place has its own characteristics. Fukuoka was subdued but had a nice and comfortable atmosphere, while Osaka really came alive." Producer Yu Suzuki made an appearance mid-way through. The topic then turned to Shenmue II: "I was told this would be the last major work from Sega for the Dreamcast, so I made it earnestly and with care. And then I heard that Sakura Wars will be coming out in the Spring of 2002. I thought, 'That's not what you said before!'" was one comment with somewhat of an edge, albeit said with a smile. Regarding Shenmue II, the original chapter 2 through to chapter 6 were incorporated. Suzuki thought that the fans would be dissatisfied without the heroine Shenhua Ling making an appearance: Shenhua's appearance was planned for chapter 6, so it was necessary to include up until that point. And hence a great volume of data had to be packed in. "We managed to get through it by changing the way we stored the data, and by using compression techniques that were superior to those in the first game," he related. A much vaster setting, 3 times that of the previous game, meant providing several new systems such as a map system. In terms of completion time, for a fast player it is around 30 hours, but it is meant to be for people who want to enjoy the story and if exploring each of the locations then play time is around 40 hours. In addition, After Burner, Space Harrier, Out Run, Hang On are all included on the 4th disk and as the story progresses a flag will be set so that these games can be played by inserting the 4th disk. 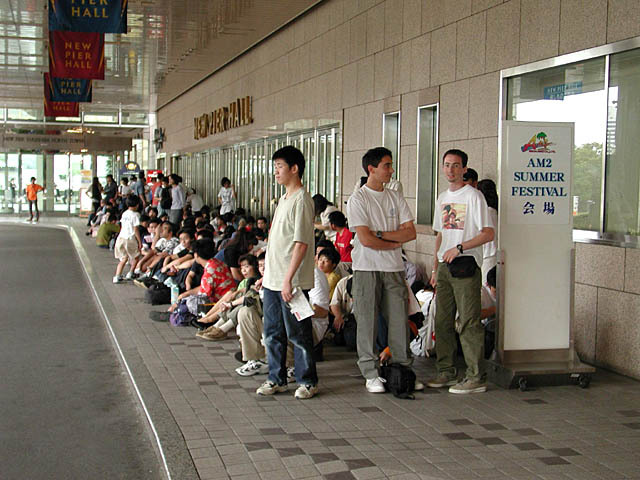 Following this, a game competition was held for Virtua Fighter 4. In one match, Takumi Hagiwara took on Yu Suzuki, and despite Suzuki only having the use of one hand he defeated Hagiwara to the great excitement of the crowd. 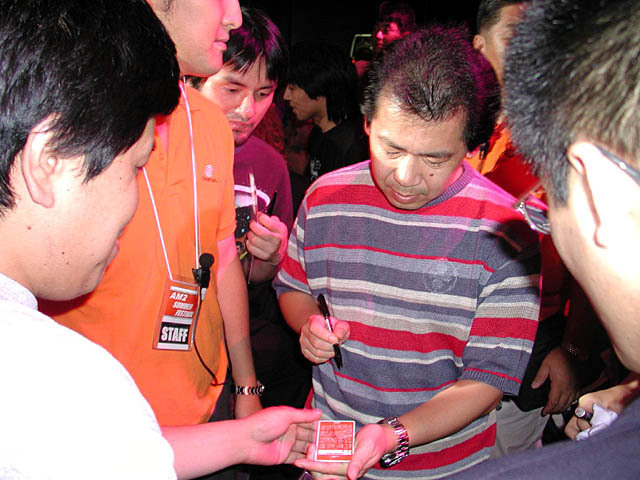 Yu Suzuki vs Takumi Hagiwara. Despite controlling his character single-handedly, it was an easy win for Yu. In closing, Suzuki said "We have games under development that haven't yet been announced by Sega AM2, so thank you for your support in future also." 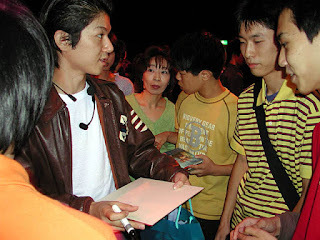 Yu Suzuki is pressed for his autograph. At some events people even asked him to sign their mobile phone. Hazuki Ishigaki was also surrounded by autograph seekers. Masaya Matsukaze responds to fan requests for his autograph. 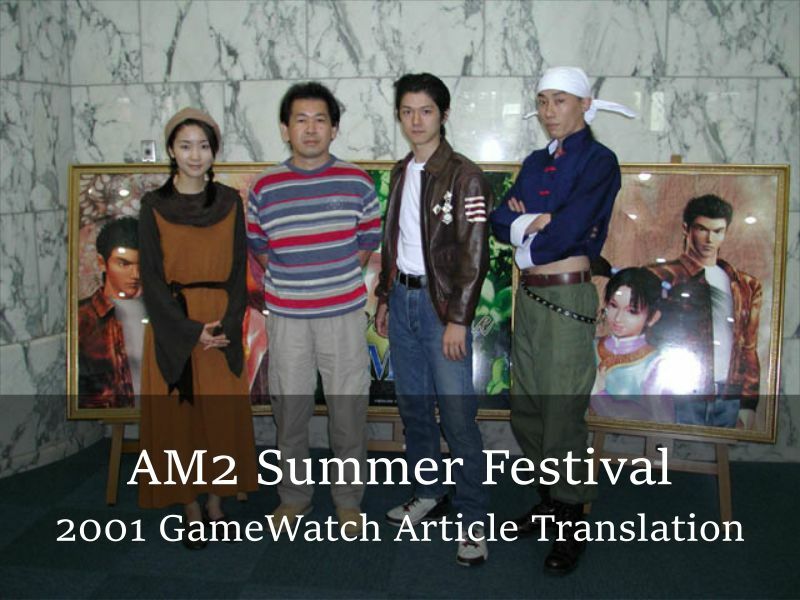 "Making of a Shenmue II TV Commercial"
I have been working on fitting English captions to the "Making of a Shenmue II TV commercial" video featuring Matsukaze and Hagiwara that was shown to attendees at the event. 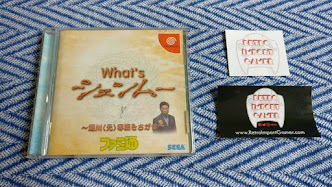 I think Shenmue fans will find it very amusing, so watch out for it here on the blog in the very near future! 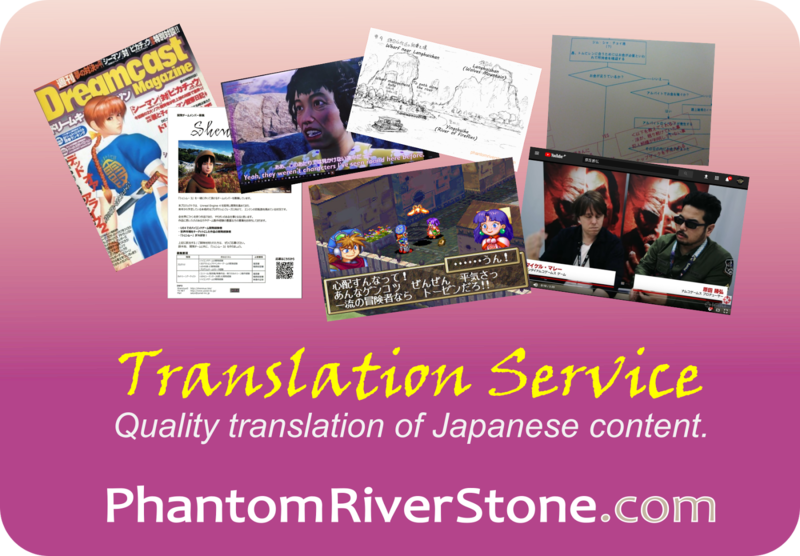 Update: the captioned video is now available here. Yeah, wouldn't it have been great to have attended.